Filing a will with a local probate court is an essential part of administering the estate of the deceased, also known as the testator. The court will do its best to divide the property according to the direction in the will, barring any ambiguities or other issues that may make the testator's intent unclear. The filing process is straightforward, and entails notifying all the interested parties and submitting the will to the probate court in a timely manner. Locate the testator's will. This may be a quick or drawn out process, depending on whether the testator mentioned his will's whereabouts to anyone. The best case scenario is if the testator already registered the will with the local probate court. If not, contact the testator's attorney, as she is usually the person that drafted the will and may have a copy. Consider also checking safety deposit boxes at the testator's bank and safes in the testator's home. Inform all interested parties of the testator's death and about the filing of the will. This includes all named beneficiaries, the executor of the will and the testator's attorney. Submit a certified copy of the will to the testator's local probate court. Obtain a court date from the probate court. The court will determine the will's validity and begin to administer the estate on this date. All parties should be notified of this date so they can appear in court and assert their rights. When an individual dies, he leaves behind an estate containing all of the property he owned at the time of his death. The estate goes through a court process called probate in which a judge distributes the estate’s assets according to the individual’s wishes contained in a last will and testament, or according to the state’s intestacy laws if no will exists. Finding a will can sometimes be difficult, however, and the court will not honor the deceased’s wishes unless a copy of the will is submitted to the judge. People have various reasons for finding a Last Will and Testament. For example, you may want to know if you have been named as a devisee or beneficiary, know who was named to handle the affairs of the estate for the purpose of negotiating a contract on estate property, or just be plain curious about the affairs of a friend or relative. 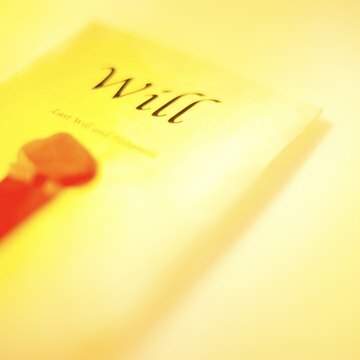 The testatrix, or maker of the will, may not have divulged the will's location prior to her death, but this should become public record once she is deceased and the will is filed for probate.